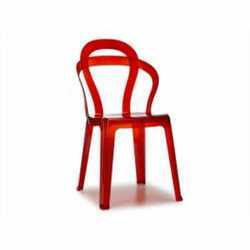 TITI by Roberto Semprini is a polycarbonate stackable chair available in different colours (transparent or solid). With its neo-liberty backrest, it is the best choice for small spaces, and indoor/outdoor facilities. Stackable. Size: W47 D54 SH45 H86 cm. Available Colours: transparent, transparent fumé, transparent red, solid white, and solid black.